Human being had been hunting almost through evolution. As hunters, people have taught themselves to be alert, confident, inventive to look for means which allowed tricking the most careful wild animals. They have also learned how to hunt in groups and share the prey. In fact, their physical and intellectual development they have been able to survive by was reached in hunting. Hunting was an industry, religion, job and pleasure even for a Stone-Age human. 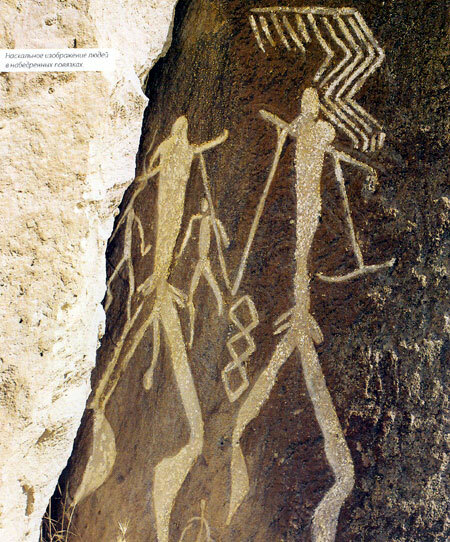 That hunting has always been more than a job necessary to survive is proved by magic inspiration penetrating Gobustan's rock pictures, an amazing gallery where local history has been depicted in thousands of petroglyphs. Pictures of wild bulls, goats, deer, lions and stylized humans perfectly suit each other in hunting and fishing sceneries. Let us note the pre-hunt magic ritual to carve straight lines (supposed to be "arrows" or spears") into goats'and deer's pictures of the Gobustan "stone books" to attract success is still repeated today: hunters of the Oguz District, Azerbaijan, hammer in a wedge into a wild goat's or deer's trace for them not to escape and be their prey. While hunting and gathering were the main food sources in the Early Stone Age, their significance decreased later on. De to settled farming to have come as a cardinal change, people became aspiring to transform natural environment instead of trying to live at its cost. However, hunt still occupies an important place in the economy. It is done on foot and on horse with bows, spears, tridents, lassos, hounds, carnivorous birds different methods being used such as trapping and chasing. The symbolic significance of hunt for the rulers of great ancient civilizations becomes clear from books about ancient history and the arts. Hunt scenes are depicted surprisingly much. The most indicative fact of that time was hunt being a sport but not a primitive murder. For instance, boars were only hunted on foot and with a spear. It seems the hunters' main purpose was to make hounds work, which often were as big as wolves, and trick a boar into a net. A striking example and proof of this fact is the lines of "Seven Beauties", an everlasting poem by Nizami Ganjavi, the greatest Azerbaijan poet, who lived in the 12th century, which tell about hunt and hunting traditions during the reign of Shah Bahram-Gurr. Nizami's "Bahram" is naturally gifted being shapely, handsome, brave and adroit, a skilled rider and hunter. He spends most of his time hunting onagers ("guhrrs"), which is what gave him the alias. However, he hunts not to kill; he brands onagers he has caught and then frees them, so nobody can catch and kill them; as a matter of fact, Bahram hunts to save onagers to implement one of the Sufi statements: there must be harmony between human being and nature. There are many legends, myths and written descriptions of shahs' and statesmen's hunt. 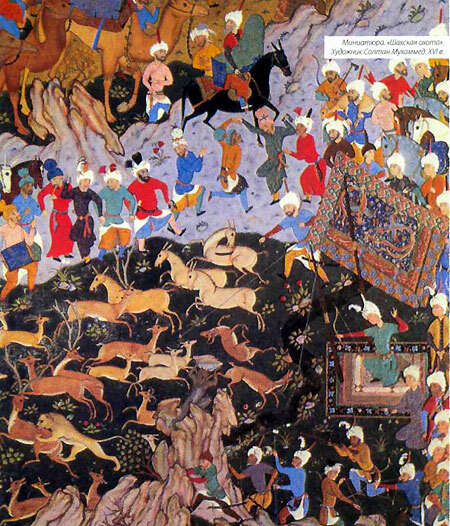 For example, Shah Abbas was proud of his army, which hunters were the most of. A legend tells he once was riding round his hunting grounds and met a stranger pretending to be Shah Abbas. The wise shah asked the stranger for a permission to have a joint hunt. While hunting, he, the pretender did, showed himself such a marksman, an adroit and prominent master, that admiring Shah Abbas presented the quasi-ruler his bow with the name on. Though hunters' weapons cardinally changed later on, the core of hunt remained the same: it can't be called a true sport if hunted animals are deprived of any chance to escape, and hounds don't participate, and hunters are not exposed even to a theoretical risk. This is also proved in "Kabus-Name", the first prosaic work of he 11th century. The author wrote the book to educate his son Ghilanshah as a collection of ethical lessons in 44 chapters, where methods, types, skills and morals of hunt are paid a lot of attention. In the Middle Ages, hunt was an inseparable component of general educating a young noble. Hunt was regulated by a code of certain moral dos and donts. Through the Medieval East, falconry was highly valued, which is a perfect example of believing it is hunter's excitement and passion, but not bloodshed what is important: having pushed a pray to the ground, a falcon sometimes lets it away unharmed. Initially, falconry was available for everyone, but later it became elites' privilege. A falcon became a symbol of a high social status as well as other carnivorous hunting birds did, which were kites, hawks, peregrines, and golden eagles. Hunting scenes have been depicted in Azerbaijan's subtlest miniatures and ceramics e.g. hunting with a domesticated panther (leopard) on that from Beylagan (a district in Azerbaijan). Sultan Muhammad's Safavi miniature depicting chase hunt is very expressive. The traditional art of carpet-weaving by Shirvan and Garabakh Schools has also shown hunt in its subject carpets. A bright color spectrum, stylized figures of hunters and animals and excellent composition are what "Ovchulug" ("Hunting") carpets are notable for. Aristocrats' and statesmen's love of falconry couldn't prevent its decline, which intensified as more and more land was worked and rifle hunt developed along with laws to protect birds. The industrial revolution and urban growth have also negatively affected falconry because there is no more opportunity of unlimited using land free of farming, made into parks. Firearms have opened a new page in the history of hunt, so hunting with rifles of different types dominates over other related ways in Azerbaijan.